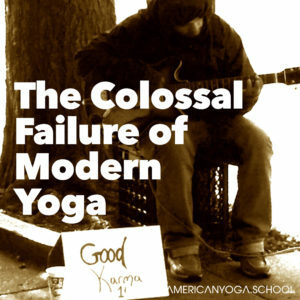 If you’re a mindfulness teacher, what would it be like for you to read this article about the failure of mindfulness, rather than Yoga, in a few years? Every time I look at the screen to write this I feel nauseous. I taught successfully within the mindfulness studio system for almost 20 years. But I don’t anymore and I think the reasons for it are worth sharing with those of you who still do. I was a full-time mindfulness teacher from 1997 until 2015. Beginning in 2004, I focused on educating practitioners so that they could be teachers. I helped get the Teacher Training at MindfulnessWorks in order when it was still a teeny company and helped grow it into the global leader in the spiritual industrial complex that it is now. Then I started my own little company so I could focus the content more on the philosophy that underlies the practice. Over the years, I’ve taught about 1,000 people to be mindfulness teachers, and a lot of them are extremely good ones. But now I just can’t stomach the thought of trying to teach in that thing that the modern world refers to as a mindfulness class. Now I’ve moved from the mindfulness mecca that is LA back home to the Chesapeake Bay where I grew up; and I’m happy to say that I haven’t seen a mindfulness studio for a few months. When people ask me why I left LA, I tell them that it’s because I couldn’t stand to look at another mindfulness teacher and, for now at least, it’s true. That’s because “mindfulness” has taken on a new meaning in the public lexicon and the new meaning is absurd. It’s been less than 50 years since the first group mindfulness class happened but in that short time, the content of those classes has veered so far off course that it falls well outside of even the most open and generous definitions of mindfulness practice. Classes with mindfulness in the name are a free-for-all now. Most of them are led by people who have practiced for a short time, then took a short training with an inexperienced teacher. Instructions about how to practice mindfulness have become practically extinct, replaced by music, smiles, and well-intentioned but misguided falsehoods. And that has slowly but surely eaten away at my ability to function as a studio mindfulness teacher because of how much energy I’ve lately had to put into dispelling the prevailing understanding of what mindfulness is, what mindfulness does, and how it does it. But I have not rejected the practice and never will. I am a yogi still. There is no aspect of my life that isn’t about mindfulness, from the big picture to the most minute details. I do the practice and I live my life according to what I’ve learned from it. I practice mindfulness because it taught me what the world is and who I am. It showed me how to recognize happiness and how to make happiness happen. The things I’ve learned on my mat provide a beacon in darkness that makes pain understandable and manageable. Insight from mindfulness practice guides me through experience by making me know that whatever is happening will never be repeated and to pay attention to it as a way to move forward with less avoidable suffering and with greater contentment. What I have learned provides solid ground when I am in a world of chaos, which is always. I want to teach those things and I used to be able to do it well. But things are different now. I loved my job so much. Almost nothing in my life mattered as much as my work. Anything that got in the way of getting the word out about mindfulness was pushed aside without much thought. I lost contact with my family, drifted away from friendships, and didn’t interact much with anybody who wasn’t part of my learning and teaching mindfulness. I sold my car to make payroll and was evicted from three homes while trying to keep my mindfulness studio open (it closed in 2013). For a long time, it felt like it was worth it. My mission in life, and its path to completion, were clear. Then a couple of years ago, I started to see that things were changing for me and I didn’t know why at first. I started showing up late to anything that had to do with teaching. I watched myself sabotage my career and my relationships with my students. Last year in Manila, I taught my 44th teacher training course. And I can tell you with great assurance that it was the worst teacher training of my career, and that it was awful because of me. I didn’t know why I was self-destructing, but I was. I would start shaking and sweating while I was teaching things that I’d taught hundreds of times before without stress. I threw up every morning. I cried every night. In the last days of the training, I broke down in a shopping mall, sat on the floor, and called my host studio owner to ask for help, something I have never done before. I didn’t recognize myself as a teacher any more. Then I came home in March and went to bed. And I didn’t get up until August. During that time Ineglected every relationship, every responsibility in my life, except the one I have with my dogs, (who have taught me more about mindfulness than anybody). When I finally woke up, I knew what the problem was. I hated being a mindfulness teacher. I started to hate my job because I wasn’t being allowed to teach mindfulness any more. Instead, I spent time with students un-teaching the idiocy that’s been learned in classes with mindfulness in the name, as well as from social media, and from the way that mindfulness is talked about in contemporary culture. It did not used to be this way. Something is wrong. Mindfulness has a big problem now. That is that most contemporary mindfulness teachers cannot answer one simple question that any teacher should be able to answer without hesitation. And that question is: What do you teach? The vast majority of modern mindfulness teachers are incapable of breaking down the most basic concepts about what mindfulness is, what the human body is, and how they can work together in this thing called embodiment. They tell their students all about the magical things that happen when you do as they say but they cannot, for the life of them, explain what it is that they are doing and how that may connect to any usable tool for living. So, what are mindfulness teachers doing, if not teaching mindfulness? Just have look at the advice that the world’s biggest mindfulness publication, Mindfulness Journal, has for new mindfulness teachers. The number one tip? They tell you to do something that is completely unnecessary but has the appearance of being a requirement: register with Mindfulness Alliance, the creator of the problem. And what is Mindfulness Journal’s next tip? Buy insurance … from Mindfulness Journal. Or head on over to social media, where the world spends a whole lot of time. See there that mindfulness rock stars like to teach how to “get” fancy meditations with a few words that are not based on reality, and are always accompanied by a flattering photo. Or scroll down a bit further and find teachers who share videos of people they’ve deemed to be bad getting killed, posted along with their clucking comment that this is karma, revealing that they are profoundly misguided about what karma is and what a mindfulness teacher’s job is. Also, my inbox has been populated lately with a new thing: promo from services that offer free sequences to new teachers as a way to get them in the door. The sequences are lists of meditations and that’s all. Teaching mindfulness from a list that somebody else created and that you don’t understand is not okay. This is not how mindfulness is taught. But the writers of the lists and the people who try to use them don’t know that because they haven’t been educated about mindfulness practice and how to teach it. The descent into this embarrassing charade called mindfulness started when Mindfulness Alliance training standards, 200 hours of contact with almost no direction about what is taught, no oversight, and no skills testing, became the norm. Teaching embodiment as a mindfulness practice takes skill. It takes an understanding of the body and an even greater understanding of the system of mindfulness, because this new thing we do, using the body as the tool for practice, is not that easy to fit into the context of traditional practice. It can happen, but it requires knowledge, training, practice and skill. However, Mindfulness Alliance requires none of those things. Their under-educated registrants cause harm by misguiding trusting students. But they are only doing what they’ve been taught by Mindfulness Alliance-registered teacher trainers, most of whom have no business teaching mindfulness, let alone mindfulness teachers. But they don’t know. It’s not their fault. It’s time that skilled mindfulness teachers, the ones who know this is not okay, to do something. I have talked to hundreds of them about this in the past couple of years and every single one of them agrees that the Mindfulness Alliance standards are way off the mark. Publicly, however, they say that we should all be nice to each other and not criticize. There is almost nothing written by other mindfulness teachers about this mess. Complacency is not mindfulness and skilled mindfulness teachers know that. So, where are you? What are you doing? Are you going to let this keep happening or are you going to speak up and help the world learn about mindfulness?